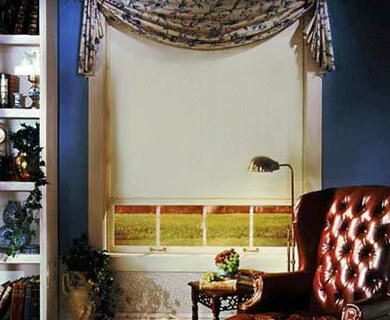 Featured in this photograph is a light cream Regency Moiré window shade, made of vinyl laminated to fiberglass. It is complemented with a floral swag held with brass leaf finials that match the design of the fabric. All Hunter Douglas window shades feature an exclusive clutch that stops and starts easily and precisely using a special continuous loop beaded cord system.